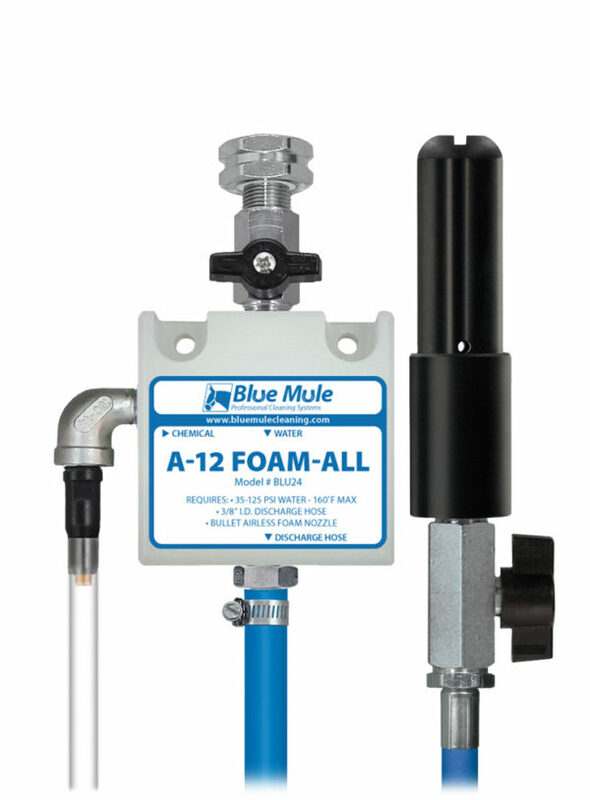 The Blue Mule A-12 Foam-All is a LOW VOLUME foam applicator for diluting and applying foaming chemicals to any surface up close or at a distance. This venturi injection system draws chemical concentrate from any sized container, mixes it with water and projects the accurately diluted solution as a wet, clinging foam. The adjustable Bullet nozzle allows the user to apply a wide fan pattern for fast coverage or a narrow pattern for longer foam throw. The A-12 Foam-All includes a 50' hose and can be permanently mounted, hung or used anywhere 50-125 PSI water is available. It is ideal for small cleaning jobs that will be done on a regular basis and is well-suited for multiple shampoo/chemical application duties around the house, stable, garage, vet clinic or kennel.